Chandler Whitmer is looking to become more of a leader. A year ago there was a sense of uncertainty surrounding the quarterback position heading into the spring as incumbent Johnny McEntee, junior-college transfer Chandler Whitmer, former top recruit Michael Nebrich and wildcat QB Scott McCummings were vying for the top spot while hot-shot freshman Casey Cochran was hoping to play his way into the equation. What a difference 12 months can make. Whitmer used a solid spring camp and a strong showing in the spring game to win the job and Nebrich transferred to Fordham shortly after failing to secure the No. 1 job. McEntee was the No. 2 QB for the entire season while McCummings continued to be used to run the ball out of the wildcat. Fast forward to this year and Whitmer is clearly the guy for the Huskies. McCummings is back hoping to show new offensive coordinator T.J. Weist that he can do more than just run the ball and Cochran is healthy and in better physical condition than he was at any point last season. In the fall the quarterback position will be somewhat crowded with the arrival of freshmen Tim Boyle, Richard Lagow and Kivon Taylor but during spring drills there is time for the trio of scholarship quarterbacks to establish their roles. Last year Whitmer was so focused on trying to win the starting job and learn the offense that he didn't always have time to establish himself as a leader on and off the field. He is hoping to change that. 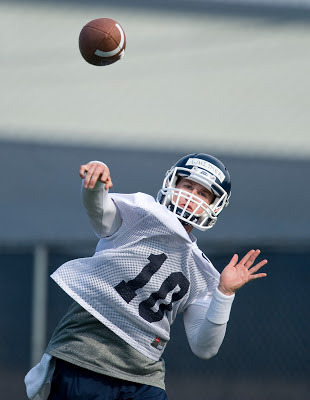 "There were times last season when I kind of kicked myself for not being more of a vocal leader and getting guys going so that is something I really want to focus on this spring," Whitmer said. UConn coach Paul Pasqualoni said that the comfort level of having Whitmer back is a significant bonus for the Huskies. "It is a big deal in the sense that Chandler was a first-year player last year," Pasqualoni said. "Obviously he has 12 tough games in him, he has been here now for a solid year and I think that showed with the way that he played. We are looking for Casey to be a little more comfortable as well. I think that part of it is good and I think it is a big deal for us. "Casey is in the best shape he has been in since he has been here. He has his weight down under control so his stamina, his endurance, the way he is running I am pleased with that. I want to see him take care of the ball a little more, he missed a snap under center, threw a pick (in Monday's practice). We had a couple of turnovers with him in there, we had two turnovers in four plays. He has to do a better job with that, he has to get familiar with it, he has to get comfortable with it and I want to see progress. I want to see the progress over the last seven weeks, I want to see it over the next eight weeks." Cochran was likely going to be redshirted during the 2012 season but once he had a mishap at home when he fell off his bike, it was a no-brainer decision to allow Cochran to sit out his true freshman season. Now he is trying to at least make a statement that he is the No. 2 quarterback and perhaps if he can play well enough he can push Whitmer as well. "It was frustrating being hurt and just having to do rehab and stuff like that, it was a learning experience," Cochran said. "It just comes with experience. I came in here at this time last year and I know so much more than I did at this point last year. Since my first practice last year I have improved 20 percent at least but there is so much I can do I need to do to get better. "In spring that is the biggest thing at any position to show what you have going into the summer and going into the camp, it gives a basis of what you can do and what the team can expect out of you so I think it is a big deal for guys to show up in the spring and work as hard as you can." With the three freshmen quarterbacks coming in, competition for practice time at quarterback will be intense in the next couple of years. Cochran figured that would be the case when he signed with the Huskies. "There is competition at every school," Cochran said. "Every school is going to have four to five quarterbacks, just working as hard as I can every day and doing as much as I can. "Chandler played last year and he is a great player and so is Scott, it is not like we are all on our own out there. We are all working together and working with Coach (Shane) Day and that is the best thing we can do." UConn lost receivers Nick Williams and Michael Smith as well as tight ends Ryan Griffin and John Delahunt to graduation but Whitmer likes the talent and potential in the returning core of receivers. "I am really excited about our receivers, we have some good guys coming back," Whitmer said. "Shak (Shakim Phillips) and Geremy (Davis) are obviously big-time guys and the younger guys have put in a lot of work." Earlier exit for Catholic 7?